One of the things I love about the start of a new year is the opportunity to “reset.” Whether it’s setting new fitness and health goals, organizing my kids’ toys and clothing, or challenging myself to learn new tech and photography skills, January seems like the perfect time to make those resolutions. This is also the time I evaluate my “techy” items and decide if I need an upgrade. Last year, I had an opportunity to spend some time at the Intel Experience Store in Los Angeles. Designed to showcase the brand’s innovation, the store offer locals a unique opportunity to get hands-on with the latest devices. Every day, passerby’s can stop by the store for free coffee and snacks, tech tutorials, live entertainment, and hands-on learning experiences from Tech Xperts. During my time at the LA pop-up store, I had an opportunity to test out the latest 2 in 1 devices. These days, it isn’t uncommon for a household to have a laptop, tablet, and smartphone. But which of devices are actually used regularly? In our household, our kids primarily use the tablet, while my husband and I do most of our work on our laptops. Intel’s 2 in 1 devices are revolutionizing the industry because they merge the portability of a tablet and the functionality of a laptop into one device. If you haven’t had an opportunity to get hands-on with one of Intel’s new 2 in 1 devices, you can visit your local Intel Experience Store to test one out. 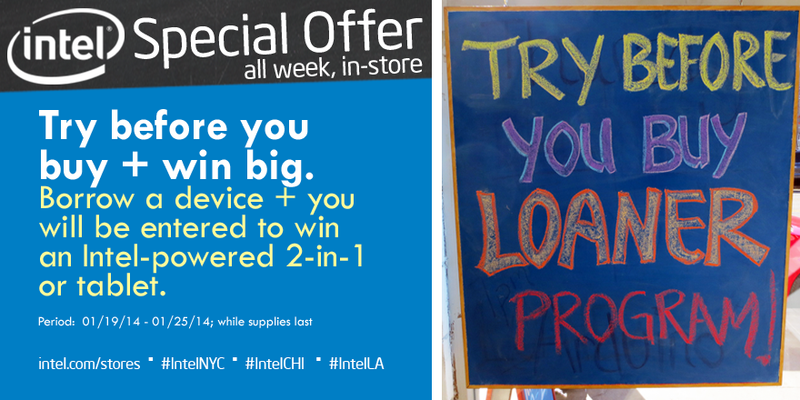 And, if you’re considering making a purchase, don’t miss out on Intel 24-hour loaner program. Anyone who borrows a device (without any obligation to purchase) between now and January 25th, 2014 will be entered to win an Intel 2 in 1 powered device or tablet. Be sure to visit your local store (Chicago, New York, and Los Angeles) for information on this exciting giveaway. 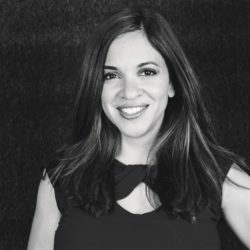 Not only does Intel stand out for its innovation, the company also endeavors to give back to local communities through the 3 pop-up stores that debuted last Fall. Intel is currently working with neighboring businesses and organizations to reinvest in the future of the surrounding communities. In Chicago and New York, Intel offers a technology recycling program where locals can bring in their old electronics for proper recycling. Intel makes a cash or technology donation to local schools in the area as part of this recycling program. 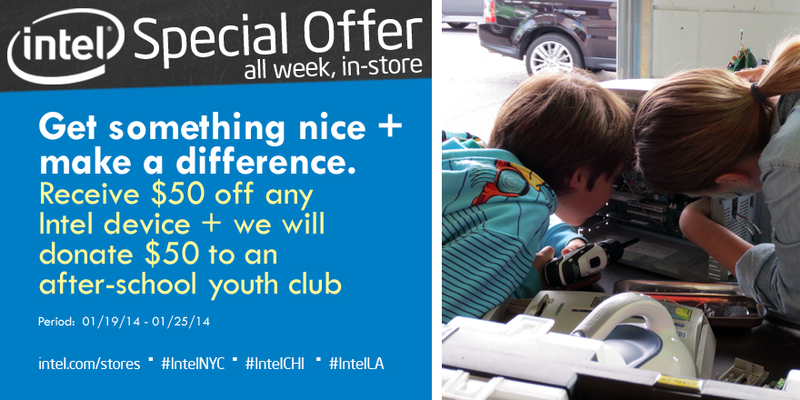 Through January 25th, visitors to their local Intel Experience Store can also take advantage of a special offer where they will receive $50 off any device and Intel will donate $50 to an after-school youth club as part of this promotion. If you didn’t get everything you wanted this past holiday season, there is still time to take advantage of Intel’s incredible offers at their pop-up stores. Through Intel’s partnership with Best Buy, visitors to their local Experience Store can purchase a device in-store. 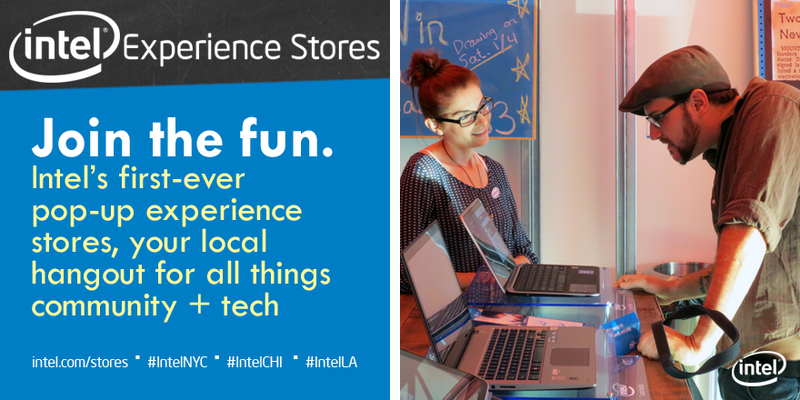 And if you’re local, be sure to visit the LA Intel Experience Store through January 31st, 2014. The store will also have an exciting finale from 4-7 pm and as soon as details have been revealed, I’ll share them here. Win It! One of you will win a 16gb Samsung Galaxy Tab 3 (MSRP: $399.99) and TEN of you will win $50 Intel Coupon Codes to use online at BestBuy.com/IntelExperience (expires 1/31/14). To enter, simply complete the Rafflecopter form AND leave a comment with the name of the Intel-powered device you’d like most after visiting BestBuy.com/IntelExperience. Comments will close on January 27th, 2014 at 11:59 PM PST. Sony – VAIO Tap 11 11.6″ 2-in-1 Touch-Screen Laptop – 4GB Memory – 128GB Solid State Drive – Black because it is light and thin. My favorite is the Intel-powered Lenovo Yoga 2 Pro Ultrabook. My laptop died a couple of months ago and I would love to replace it with this beauty! I’d love to own the HP – ENVY TouchSmart 23″ Touch-Screen All-In-One Computer – 8GB Memory – 1TB Hard Drive, powered by Intel …to store all of my music and family files, Love the huge HD. Thank you! The Lenovo – ThinkPad Tablet 2 10.1 inch with 64GB Memory – Black. I would really like to have a tablet to have the convenience of mobility and something smaller than a laptop and lighter in weight. I like the Toshiba – Satellite 15.6″ Touch-Screen Laptop – 8GB Memory – 750GB Hard Drive – Prestige Silver because the Laptop I have right now keeps crashing-it is really old, and I am sure this laptop will work so much better for me!! I like Samsung Galaxy because I had heard great things about it. Microsoft – Surface Pro 2 – 64GB – Dark Titanium, because it has wifi, light, 64gb so high storage capacity. Great for the kids to work on also! Samsung Galaxy Tab3!!!! It perfect for carrying around at work! I like the Lenovo – IdeaPad Yoga Ultrabook 2-in-1 11.6″ Touch-Screen Laptop because it’s versatile and seems like a good computer. I like the HP – ENVY TouchSmart 23″ Touch-Screen All-In-One Computer – 8GB Memory – 1TB Hard Drive because it seems like everyone in our family would love to do something on it! I would love to own the Toshiba – Satellite 15.6″ Touch-Screen Laptop – 8GB Memory – 750GB Hard Drive – Prestige Silver because it has a good amount of memory to store treasured videos and photos! Would love to try the Microsoft – Surface Pro 2 – 64GB – Dark Titanium because it seems like a good tablet an it’s very portable and it comes with a USB port. Any laptop! I need one so bad! Because this machine is a beast with powerful gaming spec but only 0.85 thickness. I would love the ultrabook 2 in 1! The Samsung Galaxy Tab 3, it the perfect size to carry around. I would like the microsoft surface that looks like fun! The Galaxy tab too. I would like the Sony – VAIO Tap 11 11.6″ 2-in-1 Touch-Screen Laptop because I like the touch-screen. Samsung tablet is one of the best tablets out there on the market. I like the Ultrabook 2 in 1 convertible because I can use it as a tablet or laptop. 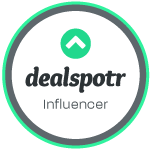 I like Lenovo – IdeaPad Ultrabook 2-in-1 11.6″ Touch-Screen Laptop. Lightweight and perfect to bringing it with me to work. I’d love the Sony Vaio Flip! I’d like the Sony VAIO portable touch screen all in one computer because I trust the brand and I’d love a portable touch screen device. I would choose the Samsung Galaxy Tab 3! My wife and I have visited the Intel Pop Up Shop in Venice, it is great! People should swing by! I would love the Sony – VAIO Tap 11 11.6″ 2-in-1 Touch-Screen Laptop – 4GB Memory – 128GB Solid State Drive – Black . This looks so easy to use and my laptop isn’t working very well! I love the HP – ENVY TouchSmart 23″ Touch-Screen All-In-One Computer. It would be perfect for my autistic kids to get on the computer with such a user friendly interface. I would love a touch screen laptop. I like the Microsoft Surface 2 – i don’t have a tablet yet. I would like the HP – ENVY TouchSmart 23″ Touch-Screen All-In-One Computer – 8GB Memory – 1TB Hard Drive because my very old and outdated desk-top needs to be retired and replaced. I would love the ENVY TouchSmart 23″ Touch-Screen All-In-One Computer – 8GB Memory – 1TB Hard Drive. I’d like Asus – Transformer T100 – 32GB – Gray, because I need a new laptop/tablet. I would love to have the Samsung – ATIV Book 8 15.6″ Touch-Screen Laptop – 8GB Memory – 1TB Hard Drive – Bare Metal. My current laptop is several years old and only has an i3 processor. It chugs along okay but I would love to upgrade to an i7 and the touch screen on this Samsung is definitely high on my list of desired features. Sony – VAIO Tap 11 11.6″ 2-in-1 Touch-Screen Laptop – 4GB Memory – 128GB Solid State Drive – Black, because it would be perfect for my husband to take on his deployments. I would love the HP – ENVY TouchSmart 23″. My computer is getting so slow and old we need to think about a new one. Plus this computer would be great also for the kids for their homework. I would love to get a Sony VAIO laptop. I love my current one,but it is getting old and I think it is time to upgrade. Lenovo – 23″ Touch-Screen All-In-One Computer is what I would love to have. Our computer is very old and the touchscreen would make it easier for my son is who is just learning how to use the computer. Ultrabook 2 in 1 would be awesome to have!! My laptop! It uses a Core i7! 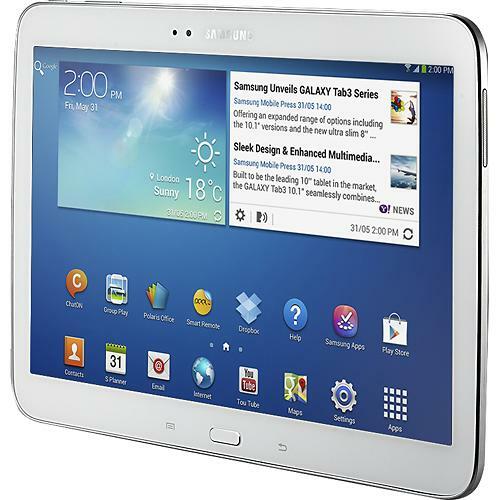 I would love a Samsung Galaxy tab 3.